A classic Massey Ferguson tractor in a field, I used a lightpainting technique to give the tractor a unique painterly look that you can’t achieve any other way. Lightpainting like this is done with a small Olight M10 Maverick LED flashlight and combining multiple images in Photoshop to build up the final image. In this case I used 31 separate images out of 81 total exposures. 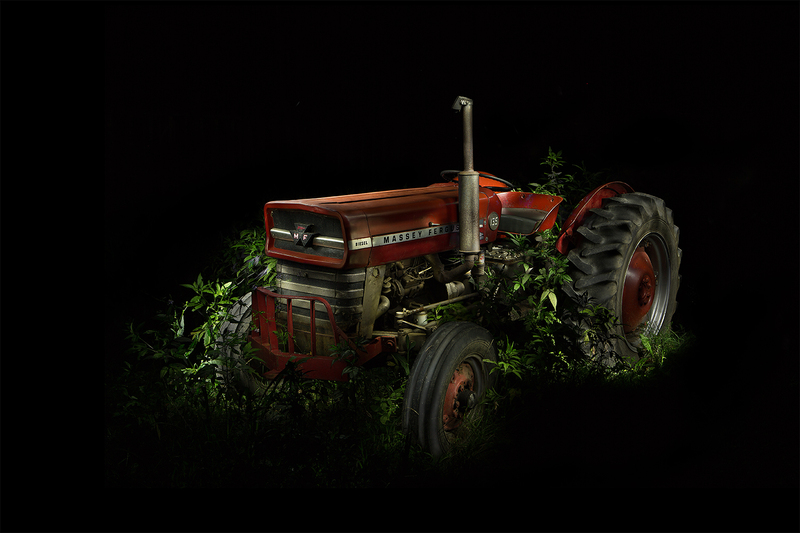 The tractor was brushed in light in small areas to light each part of the image slightly different but will still blend well with the other 30 images. In Photoshop the images are stacked and blending modes changed and then layer masks where used to help blend all the images together to come up with the final image. 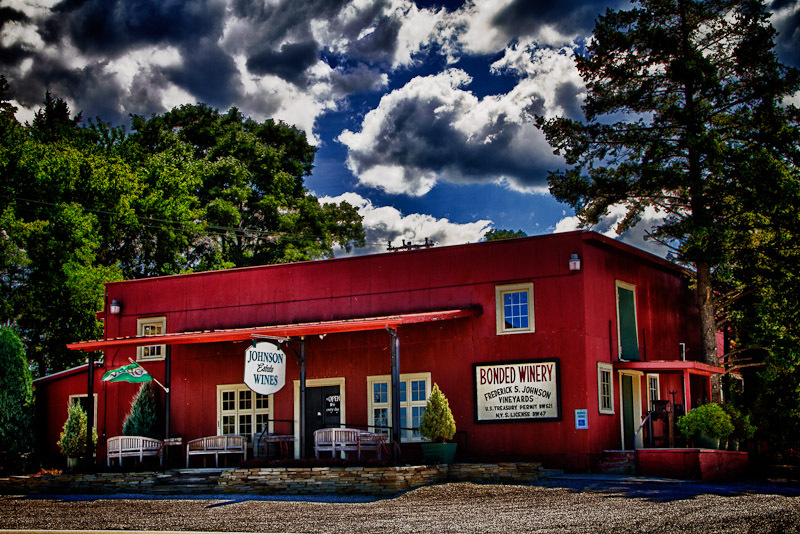 Categories : Chautauqua County N.Y., Chautauqua N.Y., Commercial Location, Jamestown N.Y., Large Product Photography, lightpainting, Location, Pa, photoshop, Photoshop Composite, Westfield N.Y. This is a self assigned photoshop exercise using a couple of images I already had on hand. The beer bottle label on the lighthouse is from the semi truck post made yesterday and the Barcelona lighthouse and harbor is a sunset panorama of the Barcelona lighthouse and harbor in Westfield N.Y. on Lake Erie is from 2010. The label was made to fit the lighthouse using the free transform tool in PS5. Some density control, contrast adjustment, and selective density control with the layers mask and bush tool was used to make the label appear that it is painted on the lighthouse. If you have the opportunity to try some of Southern Tier Brewery’s offerings you should try it out. Categories : barcelona lighthouse harbor new york, Barcelona N.Y., Chautauqua County N.Y., Commercial Location, HDRI-High Dynamic Range Images, Large Product Photography, Location, panorama, photoshop, Photoshop Composite, Retouching, Tourism, Westfield N.Y. 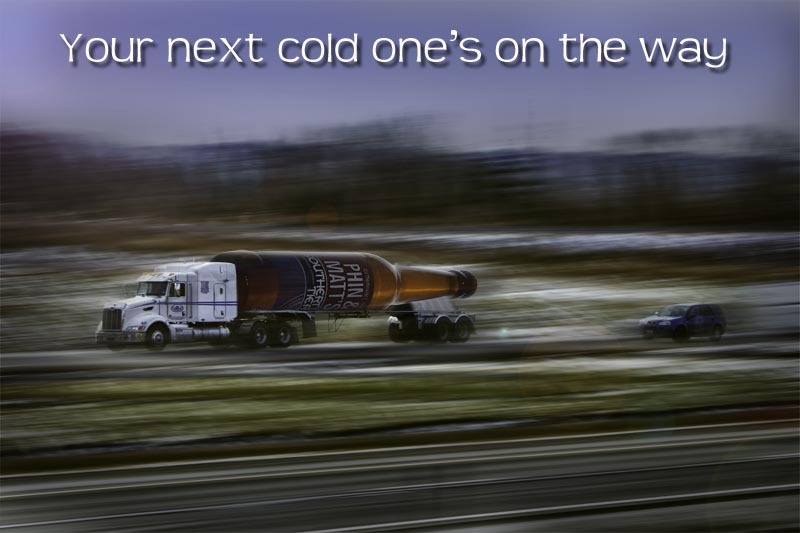 This is a composite image of the truck and beer bottle. The truck was taken at ISO 100, f13 @ 60th of a sec. with a 44mm zoom on the lens. 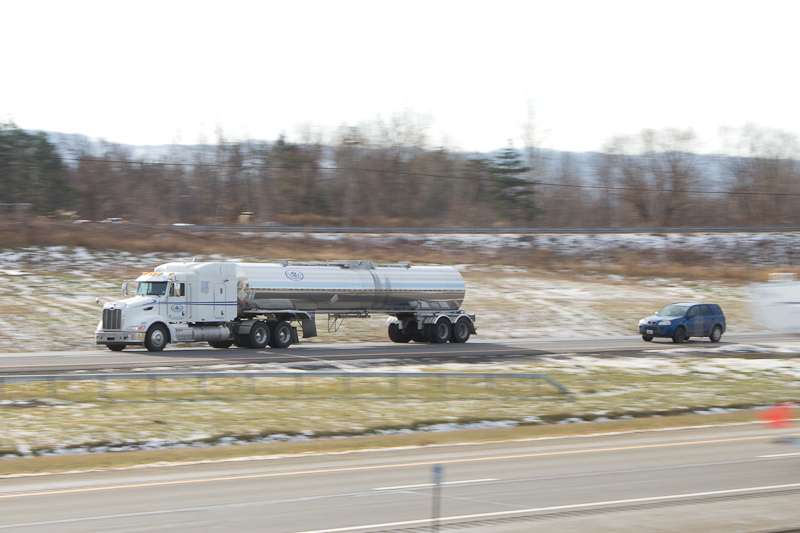 The truck was moving at about 60 mph and I was hand holding the camera thru a pan. 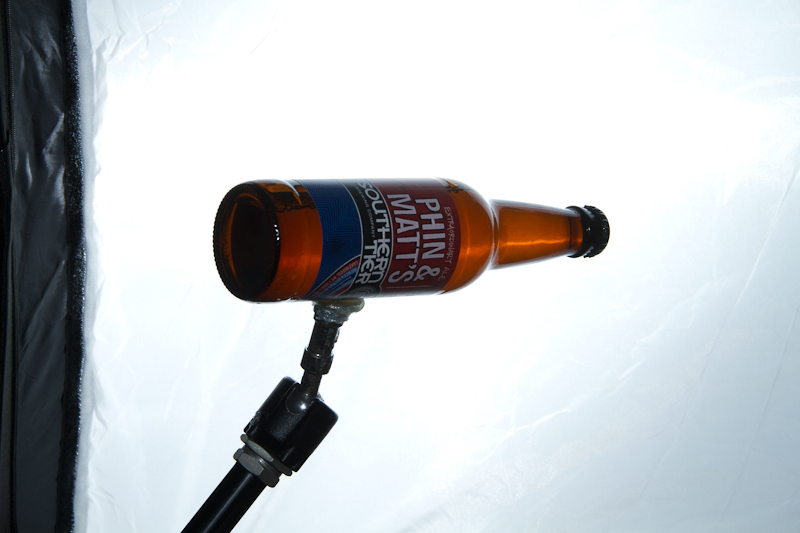 The beer bottle was shot in the studio with 2 canon 580 exll on camera flashes, 1 on the camera for fill and one behind the bottle in a 24″x24″ softbox triggered with radio poppers. The on camera flash that was used for fill was 2 stops less than the back light. Both images where taken into PS5 for the composite, motion blur was added to separate layers and dupes of layers to give me complete control. Some desaturation was added as well as color in the sky, darkening of the corners and sky, and I “constructed” the structure to support the neck of the bottle. I also added some noise to the bottle to better match the trucks noise or grain. 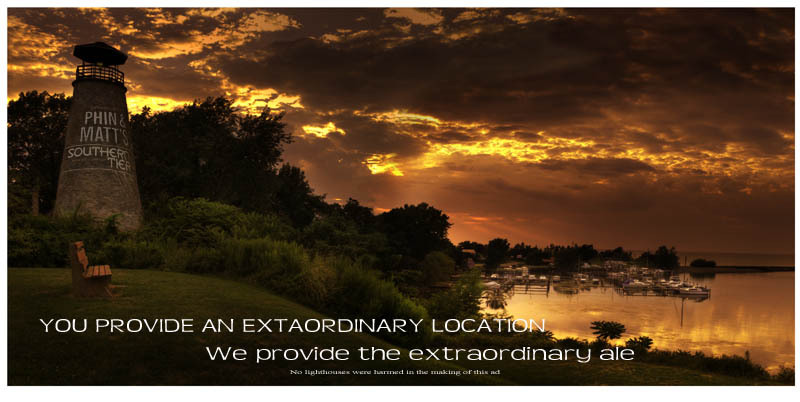 Categories : Chautauqua County N.Y., Chautauqua N.Y., Commercial Location, Large Product Photography, photoshop, Photoshop Composite, Retouching, Westfield N.Y. The truck I found parked in a parking lot at the Chautauqua Mall. The truck image was taken with a Canon G12 point and shoot camera, it was all I had with me. 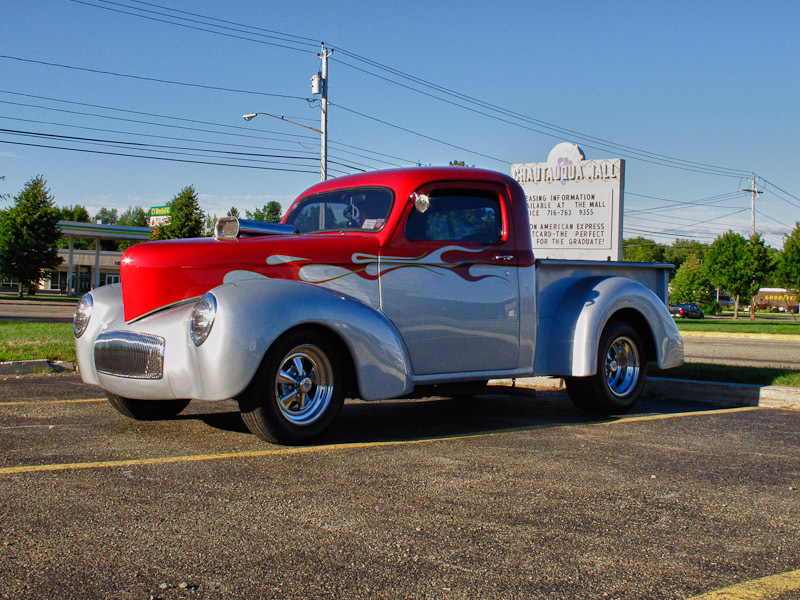 The truck was cut out of its background using the pen tool in PS5, I also cleaned up the front fender and the door of the truck to reduce the reflection in both. The side and rear windows were also cut out to show the background. The background was burned in or darkened were the window are to indicate the tint of the windows. 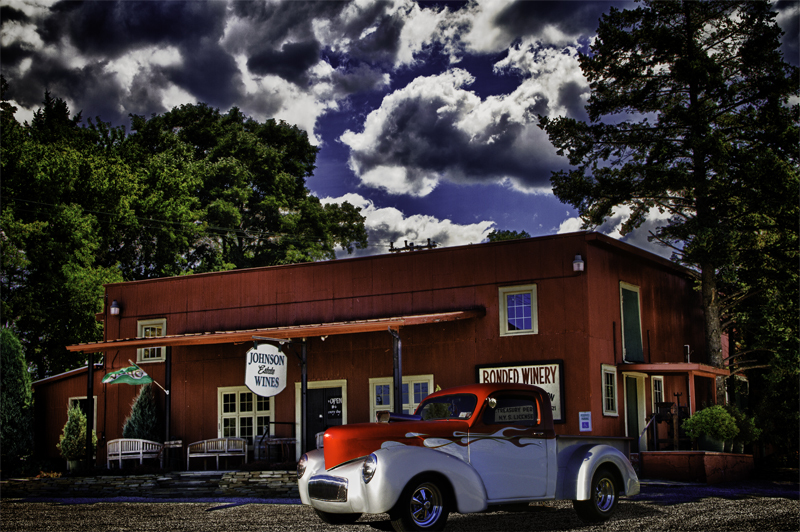 Categories : Chautauqua County N.Y., Chautauqua N.Y., Commercial Location, HDRI-High Dynamic Range Images, Large Product Photography, Location, nik software HDR efex, photoshop, Retouching, Westfield N.Y. This photograph that was taken on the shores of Lake Erie in Westfield New York started out as an exercise in lighting a large product with small on camera type flashes. After finding the correct ambient light exposure using the shutter speed to record the sunset at the tone I felt was proper I set up two on camera type flash units facing back towards the trees with orange gels on each to provide some colored detail to the trees and surrounding foliage. The next step in the process was to place two additional on camera type flash units on the ground facing towards the car to illuminate the ground under the car. An additional single flash unit was placed inside the car to light the interior. One more stationary flash was placed on a small light stand facing the car from camera position to provide illumination onto the grass in front of the car. Each of the the flash groupings as described above were exposed separately to allow me some flexibility while combining the exposures in Photoshop. The headlights and marker lights on the car itself were also exposed as a separate exposure. 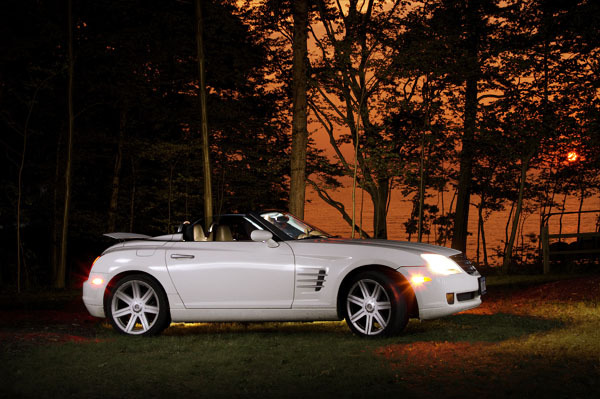 The exposure on the car itself was accomplished with multiple flash pops from a unit in a 24″ x 24″ soft box. During the multiple pops of the flash unit I walked around the car to accomplish an even smooth lighting on the side of the car as well as on the front of the car and the hood. With the seven separate exposures in the camera one for the sunset, one for the trees, one for the ground behind the car, one for the interior of the car, one for the headlights and marker lights, one for the foreground exposure and one for the light painting of the car itself I took all these exposures into Photoshop and combined them to come up with the finished product you see here. The reason that I spent this much time and energy making so many individual exposures was to give me the flexibility I needed in Photoshop to control each element independent of each other that way I can control color brightness density in any of the other adjustments to come up with exactly the image that I have envisioned in my mind before I get started.